I was traveling on the day I published my Billy Graham Rule post and grabbed the latest copy of The Atlantic (I consider it to be one of the last great magazines). I was intrigued to see the cover issue addressing a related issue, posing the question, “Why is Silicon Valley so Awful to Women?” by Liza Mundy. For such a liberal and forward oriented industry, it would seem that tech is still very inhospitable to women. How so? Susan Wu, an entrepreneur and investor, says that when she was teaching herself to code as a teenager, she was too naive to perceive the sexism of internet culture. But as she advanced in her career and moved into investing and big-money venture capitalism, she came to see the elaborate jiu-jitsu it takes for a woman to hold her own. At one party, the founder of a start-up told Wu she’d need to spend “intimate time” with him to get in on his deal. An angel investor leading a different deal told her something similar. She became a master of warm, but firm, self-extrication. How ugly is this? What a backward set of skills we expect of such talented women! Our nation is fumbling through many things right now, but degradation of women is certainly one of the items at the forefront. The battle of the sexes is a human issue immemorial. It’s so morbidly fascinating that even in such a modern and liberalized setting as Silicon Valley, men are still so prone to devolution, isn’t it? An addendum comes from a Google initiative confronting the ill of “Unconscious Bias.” They mention it in the article, but here’s a video Google produced. It’s hard to fathom that most senior citizens were part of an era where black people basically weren’t given the opportunity to play professional sports, isn’t it? It was 70 years ago when Jackie Robinson became the first black to play in modern major league baseball. Almost 10% of Americans were alive when this happened (over 20 million). And we act like our national race issue is somehow ancient history? Anyway, I leaned into this nice New Yorker article, reminiscing with sports reporter Ed Silverman on that poignant spring day in 1947 Brooklyn. 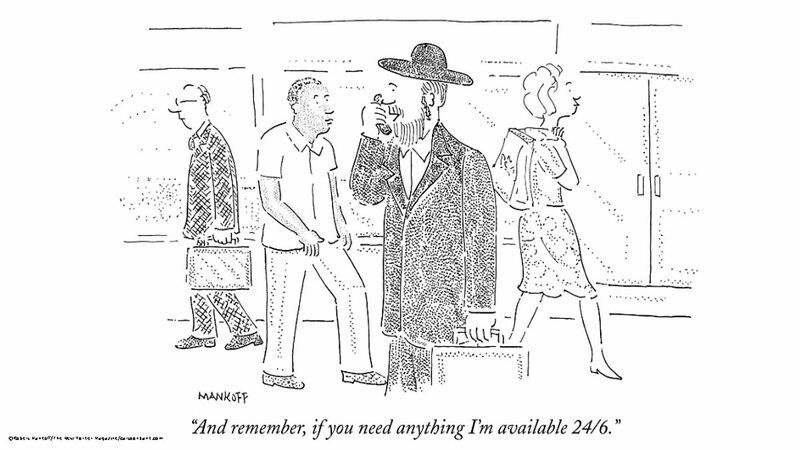 Speaking of the New Yorker, I’m a total geek about their cartoons! The first thing I do when I see an issue is pick it up an snicker my way through. So their cartoon editor Bob Mankoff is retiring (here’s his oeuvre), and NPR did a short interview with him. You can either listen or read. I very much appreciated this quote. And by having a sense of humor, it means we have a perspective on the quotidian, everyday absurdity of it all. … Being funny is being awake. A little column in Christianity Today by Todd Johnson (of Gordon-Conwell Seminary and Boston University) reflects the Protestant Reformation at 500, and on where we find this movement 500 years since Luther hung his 95 theses. By 2050, it is expected that less than 10% of Protestants will be European. African Protestants were only 1.7% of all Protestants in 1900—and these mostly Europeans in South Africa—but in 2017 they represent 41% of the global total and are projected to reach 53% by 2050. That is, sometime around 2040 half of all Protestants will live in Africa. Do you like infographics? (I do.) Here’s one he provides comparing the 1517 Protestant composition to the 2017 one. Major northern cities remain very racially segregated, and Chicago is among the most. We should all read about both the political and economic histories involved in the issues of American segregation. It’s far less innocuous than people living around people that look like them; it’s perniciously unjust to this day! [I]n earlier Chicago, the poorest people weren’t getting money from banks anyway. They were forming their own banks, what I call immigrant microlending institutions, what they called building and loan societies. They were finding different ways to access credit. That story of who gets to access credit and how is a really important story about who gets to access upward mobility in America. I think it’s a story that’s still playing out. It is indeed still playing out. You can read more about the predatory practice of “contract selling”—which is one of many untenable options the poor are left with—in this Chicago Reader feature. As a nation, we need to keep getting educated, and we need to do so in an sympathetic effort of understanding. Our harmful and ignorant dismissals of the plights of real people and communities is beneath our national ideals. We can do better. Let’s!